Melt the remaining 2 tbsp of butter in a large skillet with the smashed garlic. As soon as the butter starts to bubble, turn off the heat and let the garlic infuse the warm butter. Remove the garlic chunks from the butter. Add the bread crumbs and lightly toss until all the butter has been absorbed. Stir in the parsley and season, to taste, with salt and pepper. Spread a layer of bread crumb mixture over the top of each fillet and bake for 12 to 15 minutes until bread crumbs are golden brown and fish is cooked through. 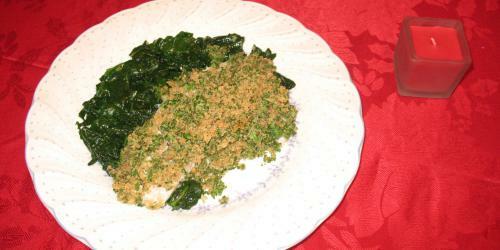 Serve each fillet atop a mound of the spinach below. Cook the garlic and lemon zest until garlic is translucent, watching carefully to avoid burning. Slowly add the spinach, moving it around as it cooks. It will cook down and create room in the pan for all of it, eventually. Once all the spinach has been added and cooked, Drizzle with the lemon juice and garnish with plenty salt and pepper. Hey, I see the directions for making the bread crumbs has you turning the heat off twice, once when the butter stops bubbling, and once after adding the crumbs. Which is right? Made this for dinner tonight and it was delicious. I’m not a fan of spinach by itself and this made it very tasty. We used red cod instead of the bass because it was there wasn’t bass at the supermarket. (unfortunately it became slightly more expensive when they charged us for salmon instead of cod and we didn’t notice…). The subject matter is a masterwork an effective to make an effort with proper planning. Here is unlimited coins of pou which will be lovable for you. Looks like a different one that I have tried so far. Interesting, and thanks for the recipe. Cheers! Amazed blog! It is very informative and thanks to share with us.